I am pleased to announce that the very first chapter of "Rise of the Apple Princess" is officially up! This is the new pony pov series cover by Foxhat94, please tell them what you think! I finally wrote something related to Tender TapsxApple Bloom (I really wish this site had a tag for Tender Taps)! It was mostly for fun and I didn't think it would get much attention, but so far it's been featured for over twelve hours! Thank you guys for your continuing support! Turns out context can be very important in avoiding embarrassing situations. In other words not animeish. Just a quick update, I'm sorry that it's been so long to get Chapter 2 of "Rise of the Apple Princess" out, but as you may imagine things keep getting in the way can prevent you from working on it, it's life. As you can tell by the title of the blog, yes, chapter 2 will be delayed. But not incredibly long. WARNING- CONTAINS EXCESSIVE HEADCANON. IF YOU ARE NOT WILLING TO GIVE ANOTHER POINT OF VIEW A CHANCE, OR JUST WANT TO START A COMMENT WAR, PLEASE LEAVE. Just a heads up. Chapter 2 to Rise of the Apple Princess is now in progress! If you haven't read the first chapter yet be sure to check it out and leave your thoughts on it in the comments. I'd really appreciate the feedback. Heya folks! I've got a new story coming out tomorrow on Monday, November 21st. "What we're gonna do now, is we're gonna learn ya how to play Buckball." "The first rule of Buckball: Never tell your parents. The second rule of Buckball: NEVER TELL YOUR PARENTS!" I'm not going to mention any aspects of the plot, so don't worry about spoilers. I'm just going to say that this is my new favourite episode. 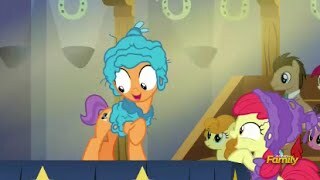 Better than Magical Mystery Cure. And I had tears in my eyes for half the episode. Seriously. Hopefully everyone will be overindulging today. I've offered up my own treat in the form of a new ongoing story, that will hopefully be approved before the end of the day. Yup, it's another scary Apple Family story. -I just submitted it. Release will be soon. -AFTER RELEASE QUESTION: What do you think should happen to Swe- I mean Apple Belle and Apple Bloom IF they get caught at Carousel Boutique? So, would anyone like to read a new story? Like, a romance featuring Apple Bloom and Spike, featuring their first date and an attempt to work through some relationship issues? 'Cuz if that's the fic you didn't know you wanted to read, I can fix you up with that. It took over two weeks, but I finally figured out something interesting to say about this episode. The overall bronalysis reaction to this episode (well, the half dozen or so that I've seen anyway) all appear to agree: this episode is a good follow-up to "Crusaders of the Lost Mark" but otherwise is a bit forgettable. The last time Grand Pear ever saw his daughter, he disowned her. She died, and he never got to reconcile. Hi there everypony I hadn't written blogs in a long while Sorry for not submitting new stories yet I have been doing other stuff, also distracted playing some games and still waiting for the inspiration. *sighs* But okay. This blog is for sharing some of my favorites and recent drawings that I have done for my friends. Hope you enjoy them.